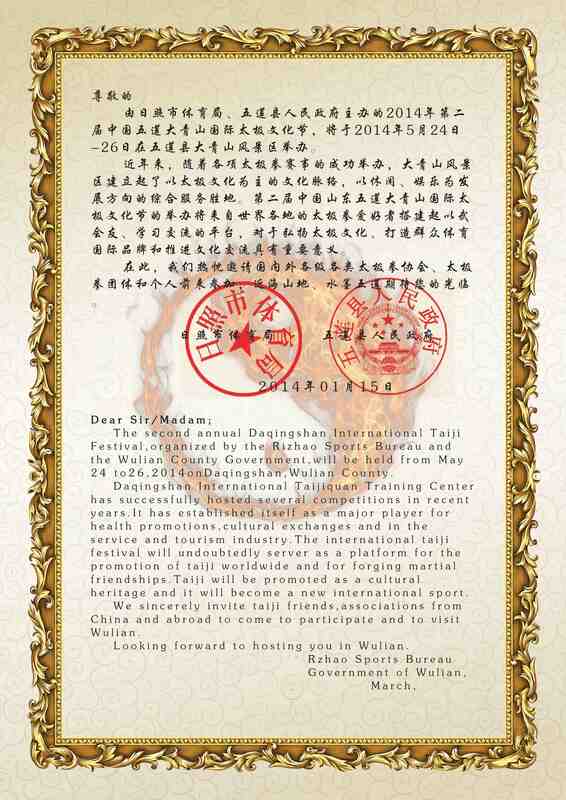 2000 yuan and certificate for the champion of each weight category. All category finals will compete in this section. There is no gender distinction. There will be two categories. Two from each category will be selected. No rewards for this section. Silver. Qingshan General. Certificate, Cup and 50,000.00 yuan. The match is conducted within a 6 square meter area. When any body part above the knee (including the knee) touches the floor, it is considered a fall. No score if the two fall down together. This refers to the case when there is no clear indication of one person falls first. If there is a clear indication that one falls first, then the other scores one. Out of bounds three times counts as one. Any fall that demonstrates total control of the opponent and execution of a technique, counts as two. No kicking above the ankle. No leg grabbing. This refers to grabbing from the back. Pushing onto the front of the leg for support is allowed. Head/neck contact is allowed. No extended holding of these areas. All throws are allowed.Note: There will be a judge, referee and team captain meeting before the competition. All rules and changes must be discussed and agreed upon. Each category must have a minimum of 3 participants. In the case of less than 3, it will be moved up to the next category. Each person can only participate in one category. Each participant can only compete in two forms, one bare-hand form and one weapons form. In addition, a participant can also be part of a group form competition. Here is the pricing package for the 2015 Conference and Competition. If you have any questions or want more information, feel free to contact me at tduehring@gmail.com. Package 2: $300 USD 6 night stay (double occupancy), pick up and delivery to either Qingdao Airport or Weifang Train Station. Entry into the Competition, 3 meals a day and 3 days of lectures and training. Package 3: $550 USD 10 night stay (double occupancy), pick up and delivery to either Qingdao Airport or Weifang Train Station. Entry into the Competition, 3 meals a day, lectures and training and 2 day tour to Qufu and Mount Tai. Package 4: $750 USD 14 night stay (double occupancy), pick up and delivery to either Qingdao Airport or Weifang Train Station. Entry into the Competition, 3 meals a day, lectures and training and 2 day tour to Qufu and Mount Tai. One week workshop by Master Chen Zhonghua begins on May 26. *Anyone with own iti will be dropped off to airport/train station from any point of the tour. **The above are subject to change without notice. What are the specific ranges of the weight categories? Thanks. How long is each match in the push-hands competition? There are two halves in each match. Each half is net 2 minutes. This means whenever there is a stop, the clock stops. Previous post: What you need to know for your Taijiquan practice?